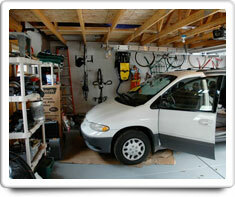 A Garage is the area of your home that is typically where a car can be parked. A Garage will have a large door (or doors) which can be opened and closed to allow a car (or cars) to come in and out. If this area does not have a large door (or doors) for cars to come through, then this area is a 'car port,' not a Garage. A Garage can also have a 'people door' (or doors), which as the name implies, are made only for people and pets to go through. If the Garage is an 'attached' garage, then the Garage will have a door connecting directly to your home. But if it is a 'detached' Garage, then the Garage will only have doors that go outside, and will not have any doors that connect directly to your home. Since your garage has cars driving in and out, it will accumulate significant amounts of dirt and dust, which can easily be tracked into your home. Shown in the 'Routine Care' section are the recommended routine maintenance tasks for your garage. The 'Q & A' section shows answers to common questions. And the 'Articles' section provides helpful articles about your garage.